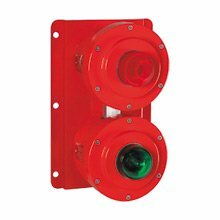 This range of versatile status lights has been designed to suit various offshore and onshore applications. Available as xenon, filament and fluorescent beacons. The XB11SL is made from corrosion-free GRP to provide a wide range of status lights to suit customer requirements. All units can be supplied as 1, 2, 3, 4 or 5 way. Area Classification Zone 1 and Zone 2 use. Options Body & lens colour, tag & duty labels. Zone 1 and Zone 2 use. UL listed for USA and Canada. Class I, Div. 1 & 2, Groups C & D.
Class I, Zone 1, AExd IIB T6. ATEX approved, Ex II 2GD. GOST ‘R’ & ‘K’ certified. Certified temperature: –55°C to +70°C*. Close-coupled and pre-wired to customer’s requirements.